14 months to write, and rewrite, and provide pictures, and to beg all of you for even more pictures. And then beg again. And now, on November 2 2015, one finished book. Officially published as of today. It started with an email that quite literally fell in my lap, on Feb 24th 2014. A small MA-based publisher, whose business model is coming up with topics and then finding authors, emailed me and asked if I was interested in writing a backyard rink book. I immediately replied indicating that I was (and that may be a lie – I may have danced around my office first). What followed was a fun, exciting, exhausting, rewarding, frustrating, and wholly life-changing experience of brain-dumping all I knew about building rinks. I hardly felt (or feel) like an authority on the topic given so many of my friends and online contacts in the niche know more than I do, so I felt a responsibility to adequately represent our community and ensure that my instruction was on point and useful. I leaned heavily on friends like Brian Falla, who wrote the foreword (by far the best writing in the entire book), and many other friends have helped with the promotion of the book. I begged and begged again for photos from all of you, who responded in a huge way. I wish I could have included every photo that you all submitted, and hope that at least one photo from each of you was included (alas, things like spacing requirements and resolution played a role). Even this website has been a victim to this project, something I will absolutely remedy this upcoming season. And now, 615 days after that first email, there’s a real, live book on the shelves. I’m told by the publisher that the initial print run is 10,000 copies split between the US and Canada. My sincerest hope is that all the knowledge you and the rink community have provided me over the years, which I hopefully have consolidated accurately…that all the encouragement and feedback you’ve given…that all the support from my friends and family…and that all of the photos you all submitted, turns those 10,000 copies into 10,000 new backyard rink families. That was the reason I wanted to write a book, and that’s the legacy I hope this book leaves behind. This book is simply an extension of that. Thank you all who have played a role in this site, the book, and our community. 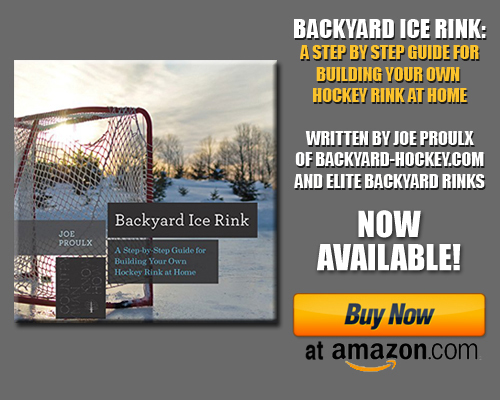 This book is not the capstone of this site – it is simply a new avenue to spread our love of outdoor hockey and the joys of the backyard rink. 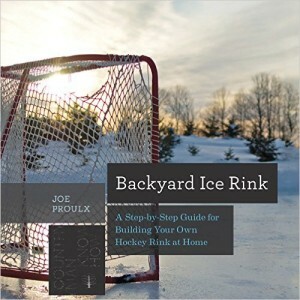 Please share the book with your network and help us turn those 10,000 copies into 10,000 new rinks. -The #1 thing you can do is purchase the book and leave a review. Whether you buy on Barnes&Noble, Amazon, or IndieBound (which also lists local indie book shops that have a copy), please leave behind your honest review. If you’re a Goodreads user, there is a page for our book there as well. Anything you can do to help influence potential book readers (which are, in turn, potential rink families), would be appreciated. -You can also share with your networks. Facebook, Twitter, email…if you know hockey people, please let them know that our book exists. -Buy it and give it as a gift for the holidays! -If you have a website, blog, or have a pipeline into any magazines or newspapers, I’d love to discuss promoting the book there. I have copies to give away and would love to work with you to get the word out. For those looking to purchase, here is some additional information. Finally, we will ABSOLUTELY be giving some copies away shortly. I will post again here when we have the details ironed out. You’ve written an amazing resource, thanks! Got the book in the mail a few days ago and have read it at least twice already, re-reading parts to help with my first build this 2015 season, perfect timing.. Thanks for the feedback! If you have time and can post a review on the site where you bought it, we’d appreciate it greatly! Thanks!